Contradictions among various political groups in the northern Afghan province of Balkh have been exacerbating. These developments are happening against the backdrop of rumours about the possible return of the vice-president of Afghanistan, the leader of ethnic Uzbeks, General Abdul Rashid Dostum, to the country, and unofficial reports about the resignation of the governor of Balkh, the influential politician, ethnic Tajik, Atta Mohammad Noor. Mohammad Alam Ezedyar, the first deputy speaker of the Afghan Senate, told Fergana News on Wednesday, 15 November, that "at such a dangerous moment when there is a real threat from the side of IS and Taliban fighters in the north, the removal of the governor of Balkh will only increase the risks, and this will not end well." Information from the region confirms the statement of the politician. According to the academician of the Balkh State University Asadullah Mazhari, since the beginning of November two explosions have thundered in the capital of the province of Mazar-e-Sharif. One of them occurred on 9 November near the "Mansour" restaurant, which resulted in the death of the elder (respected community leader - note by Fergana News) Haji Abdul Ghani, who was the opponent of the governor of Balkh and criticised the actions of his administration. On 14 November, in Mazar-e-Sharif, another political opponent of Noor, Dr Haydar, was shot in his drugstore. Before that, he had received threats by telephone with demands to stop speaking against the governor of Balkh. From the conversations of the Fergana News correspondent with the residents of the Afghan north, we can conclude that since the beginning of November the situation in Mazar-e-Sharif and the nearest areas has deteriorated sharply; cases of kidnappings of elders and entrepreneurs have increased. Such developments cause concern among the population. For example, Farishta, the Balkh State University student, told that she and her friends are afraid to attend the university after the November bombings and when civilians had been abducted in some parts of the city in broad daylight. In turn, people from the inner circle of General Dostum say that when he returns from Turkey, rallies will be organised in Balkh, which will express dissatisfaction with President Ashraf Ghani and the central government in Kabul. Some commanders of armed detachments in Balkh, as well as in the neighbouring province of Jawzjan welcome the return of Dostum to Afghan politics, according to the Fergana News correspondent. Dostum is also awaited by members of the opposition "For the Salvation of Afghanistan" movement, whose members, besides Dostum himself, are Atta Mohammad Noor, Second Deputy Prime Minister Mohammad Muhaqiq, Afghanistan's Foreign Minister Salahuddin Rabbani. There are conflicting rumours around the return to the country of Dostum in recent days. Kanishka Turkistani, one of the spokespersons of the National Islamic Movement of Afghanistan Party (NIDA), told Fergana News that on 13 November, General Dostum arrived in Tashkent from Turkey, where he had been. And on 14 November, he passed through Termez, and then through the Afghan Khairaton went to Mazar-e-Sharif, where his main residence is. However, a deputy of the Afghan parliament and one of Dostum's supporters, Bashir Ahmad Tayanch, told reporters in Kabul on 13 November that General Dostum will return to the capital of Afghanistan within two weeks (after medical treatment in Turkey) and begin his official duties. At the same time, Tayanch clarified that the leader of ethnic Uzbeks of Afghanistan intends to support the policy pursued by the Afghan government. In recent days, information that the general will soon return to Kabul sounded not only by supporters of General Dostum but also government officials in Kabul. Moreover, a source close to the government, on condition of anonymity, told the Fergana News correspondent that at the beginning of November the unofficial delegation from Kabul travelled to Turkey having the task to convince Dostum to return to Afghanistan. There were several members of the Afghan parliament and negotiators from both the supporters of Dostum and Ashraf Ghani as part of the delegation, according to the source. A number of political observers in Kabul say that if Dostum returns to Kabul, then not at the will of his opposition friends, but under the pressure of Turkey and some NATO member countries, who do not want strained relations between the president and the vice-president of Afghanistan on the eve of the elections in the parliament and in the city councils. For example, Kabul political commentator Yunus Fakur told Fergana News that Dostum was offered to return at the insistence of the Afghan president and his followers since Ashraf Ghani wants to break the opposition alliance between Dostum, Noor, Muhaqiq, and Rabbani and expand his influence in the parliament and city councils. In turn, Mohammad Muhaqiq, responding to the question from the correspondent of Fergana News said that the vice president himself had not told him anything about the return, but if this happens, the government will create no obstacles. 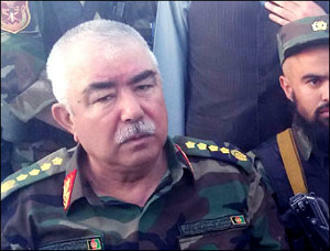 General Dostum left Afghanistan as a result of the scandal involving the abduction and torture of the former governor of Jawzjan province Ahmad Ishchi in November 2015. This case generated great stir not only in Afghanistan but also beyond its borders. The US administration insisted on thorough investigation and punishment of all the perpetrators. However, Ashraf Ghani did not dare to arrest the influential politician and military commander, who had his well-armed militia at his disposal, including artillery and tanks. But as a result of the pressure exerted on the general and the lengthy negotiations with him by the emissaries of Ghani, in May 2017 Dostum left for Turkey, where he was granted asylum. In early July 2017, General Dostum initiated the formation of the opposition "For the Salvation of Afghanistan" coalition in conjunction with the party of Afghan ethnic Hazaras "National Unity" and the "Islamic Society" party, in which the leaders of ethnic Tajiks Salahuddin Rabbani and Atta Mohammad Noor play prominent roles. 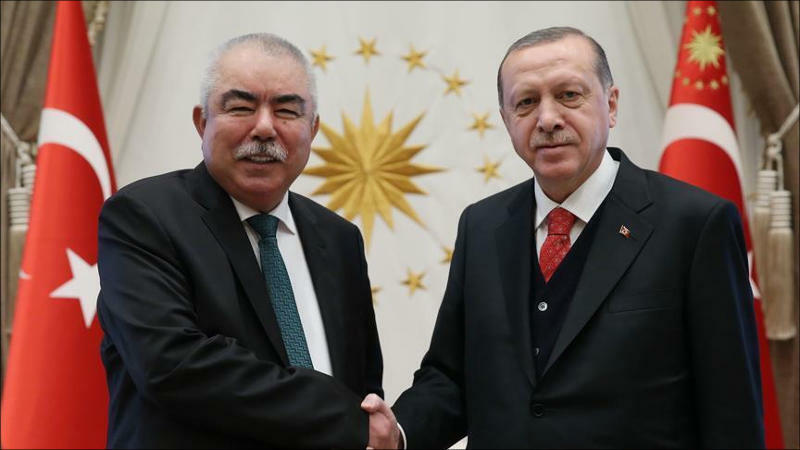 It is unusual that on 17 November, the Turkish "Anadolu" agency reported the meeting of Turkish President Recep Tayyip Erdogan and General Dostum. At the same time, it was pointed out that the vice-president of Afghanistan will return to his homeland "shortly."